Hybrid SUVs with all-wheel drive offer you an impressive win-win situation. They deliver a nice boost in fuel efficiency thanks to their high-tech powertrains and you also can use the same technology for improved traction. For most of the entries here, a gas engine turns the front wheels in normal driving. 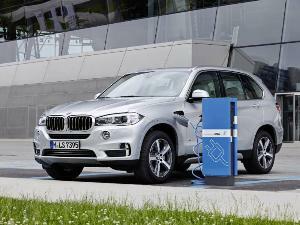 Then, when extra grip is needed, electricity from the vehicle’s hybrid system is used to power the rear wheels. That may sound like an expensive proposition, but it doesn’t have to be. In fact, today’s gallery is evenly split between mainstream SUVs and those from the premium brands. We have some choices with plug-in hybrid powertrains, too. These supply hundreds of miles of hybrid-style driving plus a significant range using electricity alone. Here are 10 hybrid SUVs with all-wheel drive. Taking things alphabetically, the 2019 Acura MDX is first on our list of hybrid SUVs with all-wheel drive. 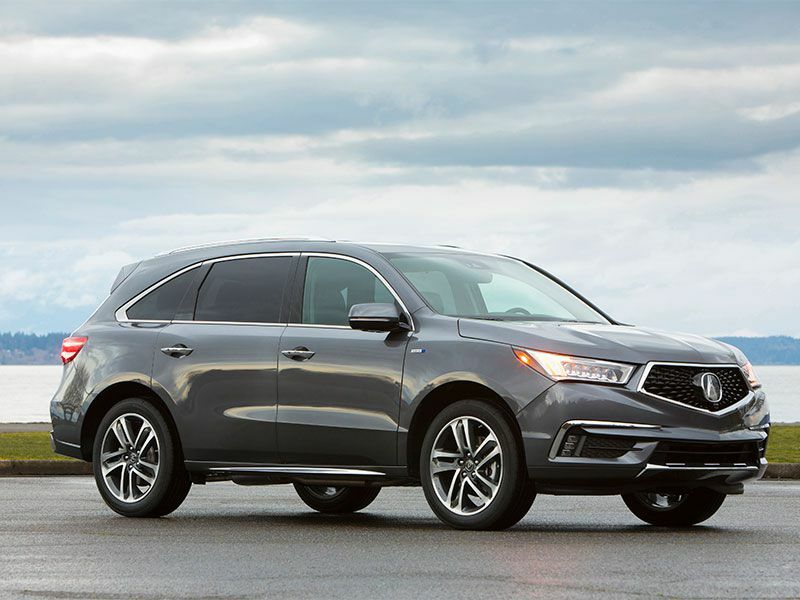 The MDX technically is a “sport hybrid” according to Acura, and that’s not just marketing fluff. This three-row SUV relies on the same sophisticated hybrid technology as the Acura NSX supercar, complete with two electric motors for its two rear wheels. The system serves up a total of 321 hp and 289 lb-ft of torque, but it also earns EPA ratings of 26 mpg city/27 mpg highway/27 mpg combined. 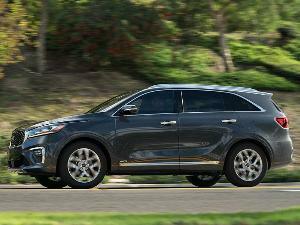 That’s a gain of 31 hp, with more than 35 percent better city fuel efficiency, when compared to the non-hybrid MDX. Another MDX highlight: The full AcuraWatch bundle of advanced safety technologies is standard. 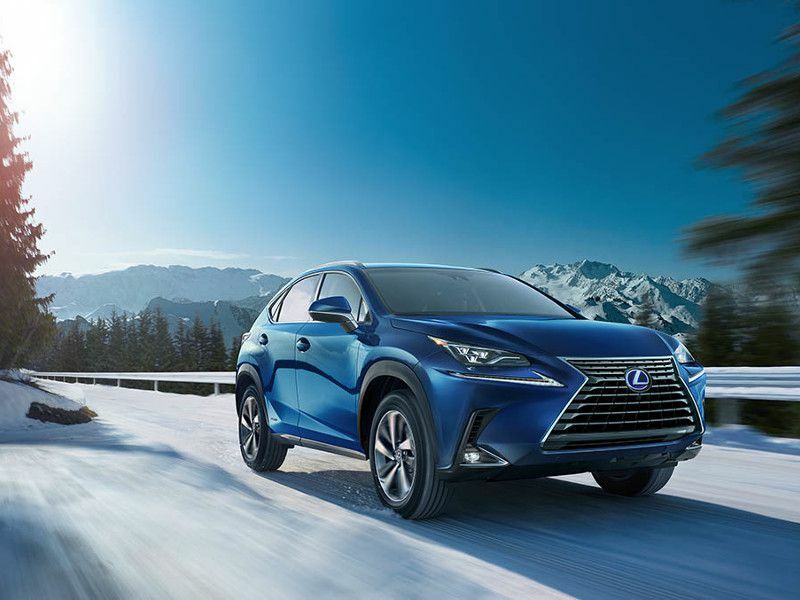 Premium hybrid SUVs with all-wheel drive also include the 2019 Lexus NX. The NX is compact in size, but its dramatic exterior design makes it impossible to overlook. You also can see fuel-economy grades of 33 mpg city/30 mpg highway/31 mpg combined when you’re driving the NX 300h. As for the actual driving experience with that model, you’ll enjoy 194 hp and a cutting-edge all-wheel-drive system. The NX brings cutting-edge connectivity as well, since it comes standard with mobile Wi-Fi and supports Amazon’s Alexa virtual assistant. For Lexus levels of luxury, supple leather surfaces and climate-controlled front seats are available. And remember, the NX 300h also provides some SUV-style capability. Its high-efficiency powertrain is strong enough for a 1,500-pound tow rating. When it comes to hybrid SUVs with all-wheel drive, Lexus also has a three-row option. 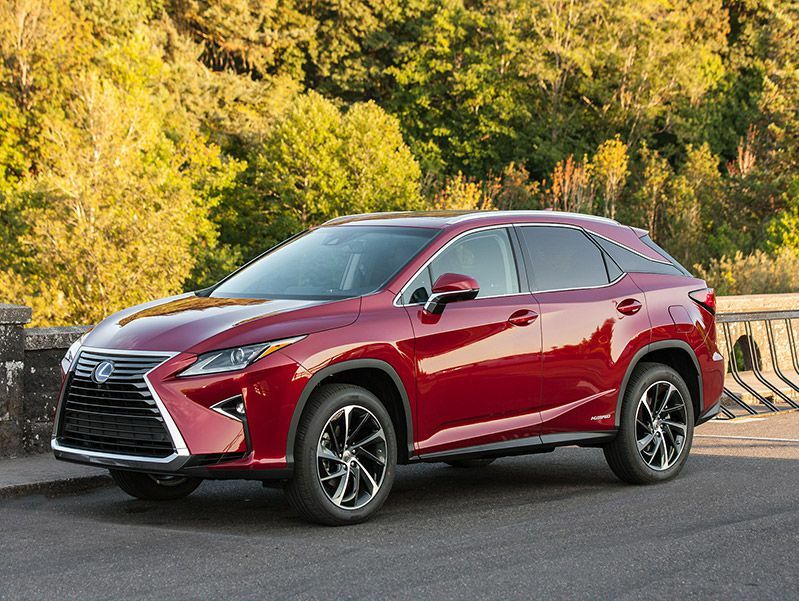 The 2019 Lexus RX 450h L is one of the new extended-length RX models, which means it’s about 4.3 inches longer than the standard versions. Yet despite its size - and a powertrain that makes 308 hp - the RX 450h L has EPA ratings of 29 mpg city/28 mpg highway/29 mpg combined. Nor did Lexus designers simply stretch out the original RX to create the bigger editions. For added third-row headroom, they changed the angle of the rear window, too. Prefer the two-row RX? 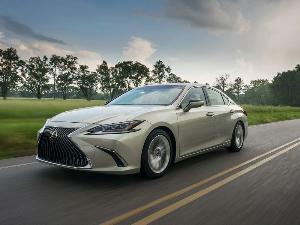 Don’t worry, you still can get a hybrid powertrain for that model, and the regular RX 450h can post an EPA line of 31/28/30. 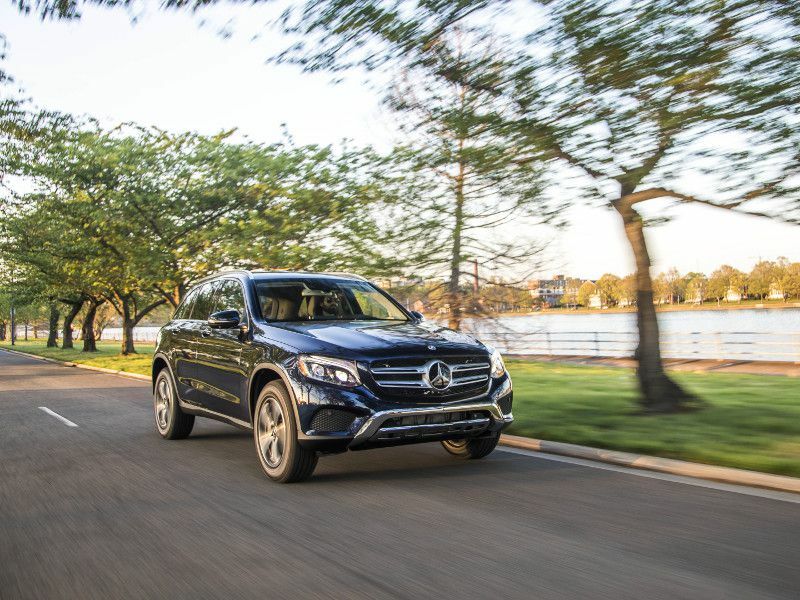 The 2019 Mercedes-Benz GLC is an example of a plug-in hybrid SUV with all-wheel drive. To be specific, we’re talking about the GLC 350e 4Matic. It’s a compact luxury suv with a turbocharged 2.0-liter four-cylinder engine and an 85-kW electric motor. Working together, those components are good for 315 hp and up to 413 lb-ft of torque - plus 0-60 times of 6.2 seconds. It’s also worth noting that the GLC stands out here with a more traditional permanent all-wheel-drive system. Of course, another difference-maker is that you can drive the GLC for up to 10 miles on electricity alone, and then you can travel another 340 miles using gasoline. 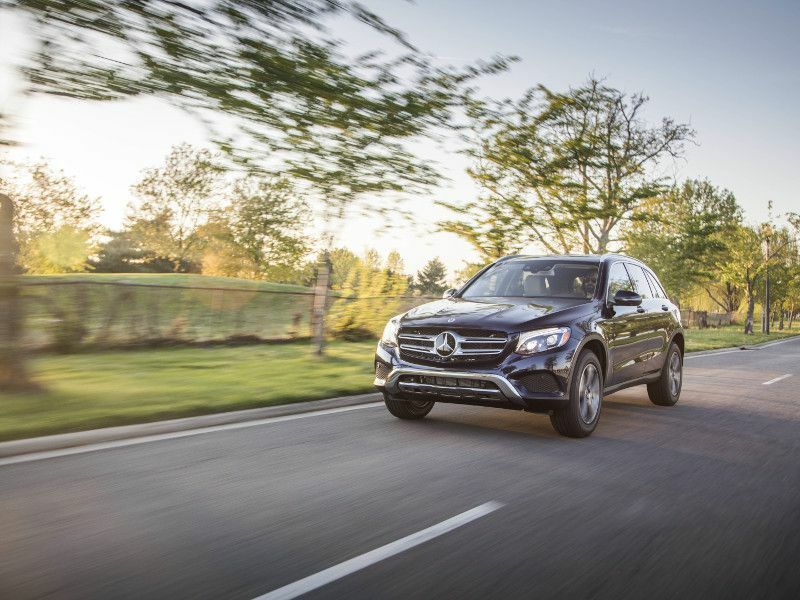 In that mode, the GLC can hit 25 mpg in combined driving. 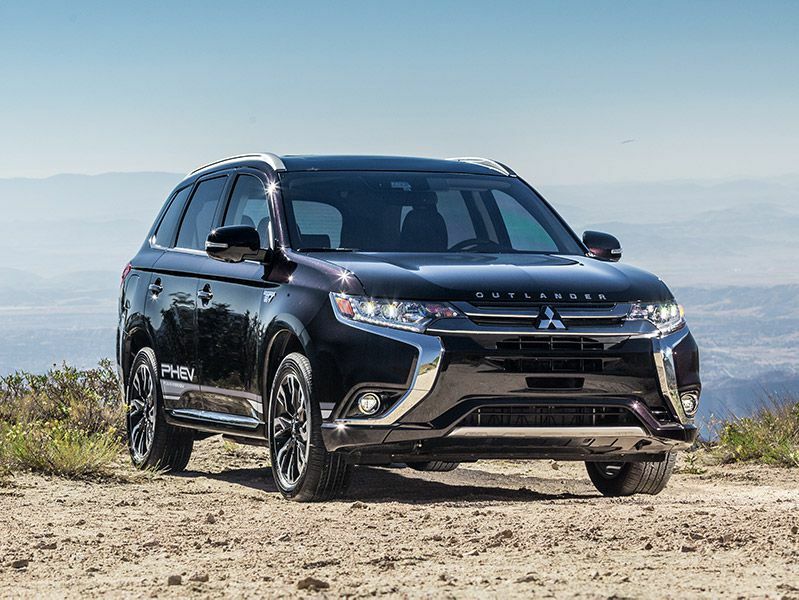 The first of our mainstream hybrid SUVs with all-wheel drive, the 2019 Mitsubishi Outlander, recently took home an important trophy. The PHEV version, which is a “plug-in hybrid electric vehicle,” is the Green Car Journal’s 2019 Green SUV of the Year. The key to the Outlander’s victory is a powertrain that provides 22 miles of all-electric driving and a further 288 miles of hybrid travel. Per the EPA, the Outlander builds on that advantage with combined efficiency ratings of 74 MPGe with electricity, and 25 mpg with gas. The compact Outlander PHEV also is fairly well equipped for a mainstream choice. Consider this: The Outlander’s standard features include Android Auto and Apple CarPlay, and you can’t get that technology at all on some luxury vehicles. 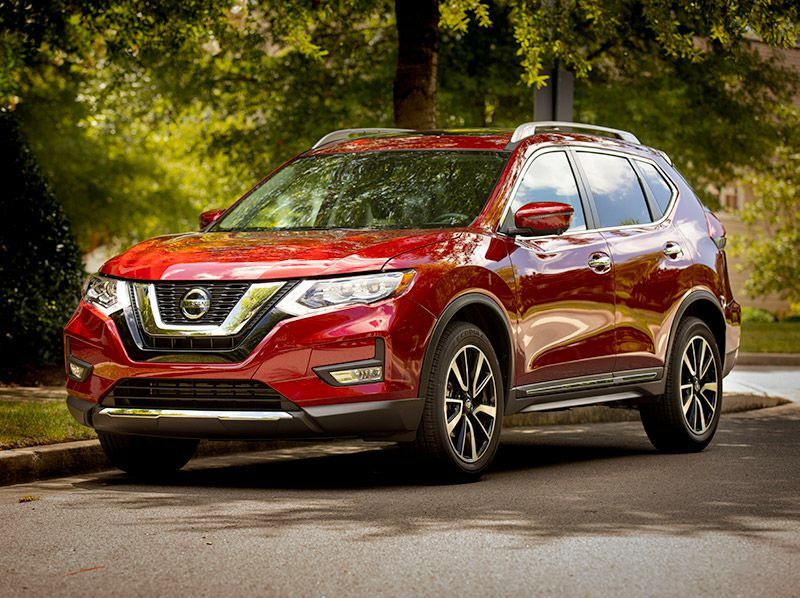 The 2019 Nissan Rogue is next on our list of hybrid SUVs with all-wheel drive, although we can’t recommend it for everybody. Sure, we like the Rogue Hybrid’s EPA ratings. With all-wheel drive, those top out at 31 mpg city/34 mpg highway/33 mpg combined. The Rogue Hybrid also welcomes new standard technology for 2019, like reverse automatic braking and a rear-door alert system. That can remind you to check the back seats after parking the vehicle. Furthermore, features like forward automatic braking, lane-departure warning, and pedestrian detection remain standard from last year. So why shouldn’t the Rogue Hybrid be on everyone’s shopping list? Because unfortunately, it’s not available in everyone’s market. Availability is limited to Nissan’s Mid-Atlantic, Mountain, Northwest, and West market regions. After three years away from dealerships, the Subaru Crosstrek Hybrid is back for the 2019 model year - and with a major difference. 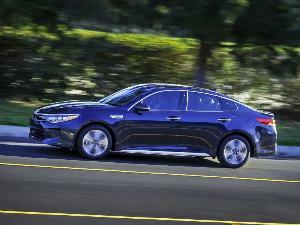 The new model is now a plug-in hybrid with an EPA-certified all-electric driving range of 17 miles. 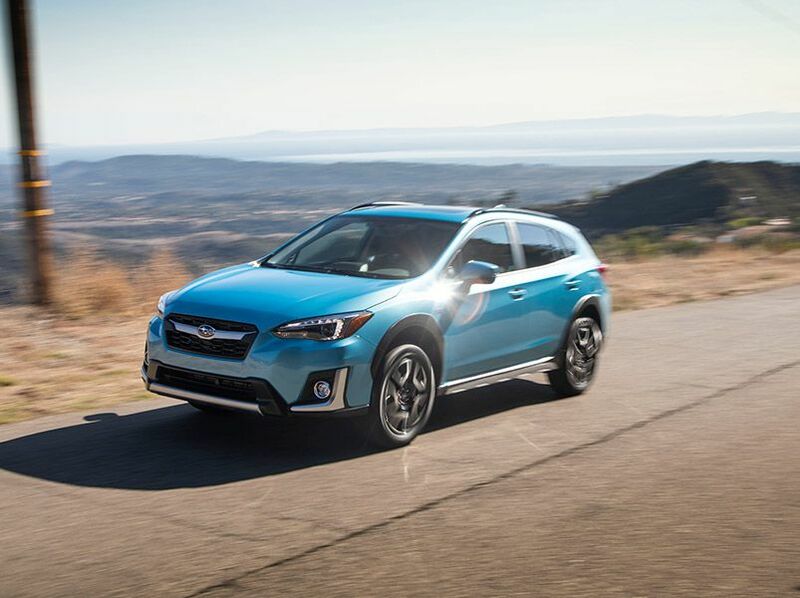 If you run out of current, the compact Crosstrek Hybrid can operate like a conventional hybrid and travel an extra 463 miles, with an EPA rating of 35 mpg combined. The Crosstrek also competes well against our other high-tech hybrid SUVs with all-wheel drive. For that, there are standard Subaru features such as an 8-inch touchscreen, Android Auto, Apple CarPlay, and the EyeSight Driver Assist package. Subaru offers a surprising sound system as well, matching up against premium entries with Harman Kardon audio. 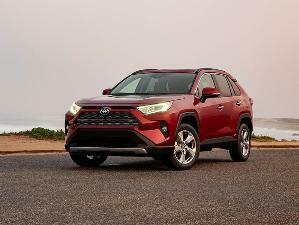 The Toyota RAV4 was the most popular SUV in the country for 2018, and with the all-new 2019 model now on sale, that momentum is likely to continue. The new RAV4 lineup features a fresh and rugged design, standard mobile Wi-Fi, and what’s expected to be a big-time jump in hybrid fuel economy. The official EPA ratings for the 2019 RAV4 Hybrid weren’t available when this gallery was assembled, but Toyota is estimating fuel-economy grades of 41 mpg city/37 mpg highway/39 mpg combined. 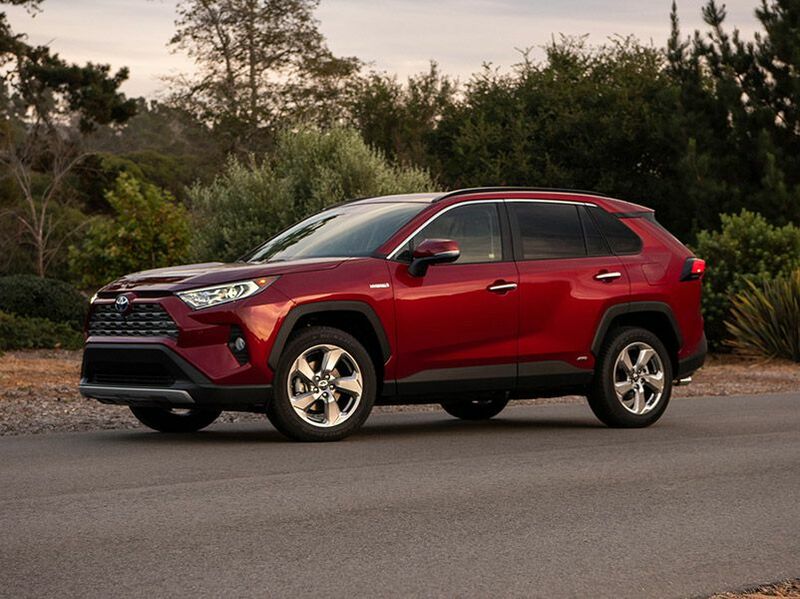 That’s an increase of more than 20 percent in combined fuel efficiency as compared to the 2018 RAV4 Hybrid. In terms of combined output, the 2019 version, with 219 horsepower, has more power than many other mainstream SUVs with all-wheel drive. 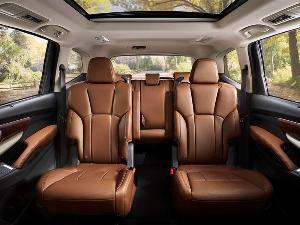 If you’re looking for a larger mainstream vehicle, hybrid SUVs with all-wheel drive also include the 2019 Toyota Highlander. 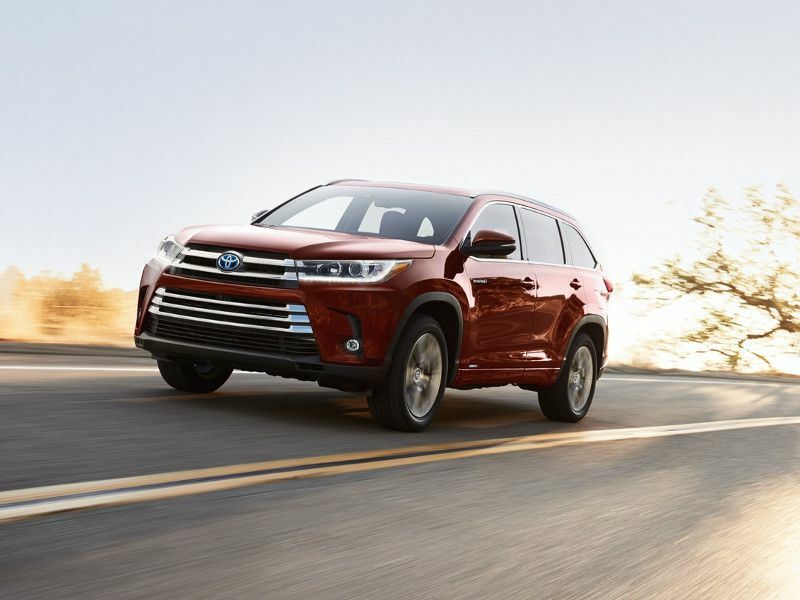 A foot longer than the Toyota RAV4, the Highlander relies on its size for a third row of seating, up to 83.7 cubic feet of cargo space, and a 3,500-pound towing capacity. But even with that capability, the Highlander Hybrid has EPA ratings as high as 30 mpg city/28 mpg highway/29 mpg combined. It also benefits from Toyota’s commitment to safety technology. As a result, adaptive cruise control, automatic forward emergency braking, pedestrian detection, and lane-departure alert all are standard. The automaker’s optional “Driver Easy Speak” system lets you reach back-seat passengers by broadcasting your voice over the audio speakers. 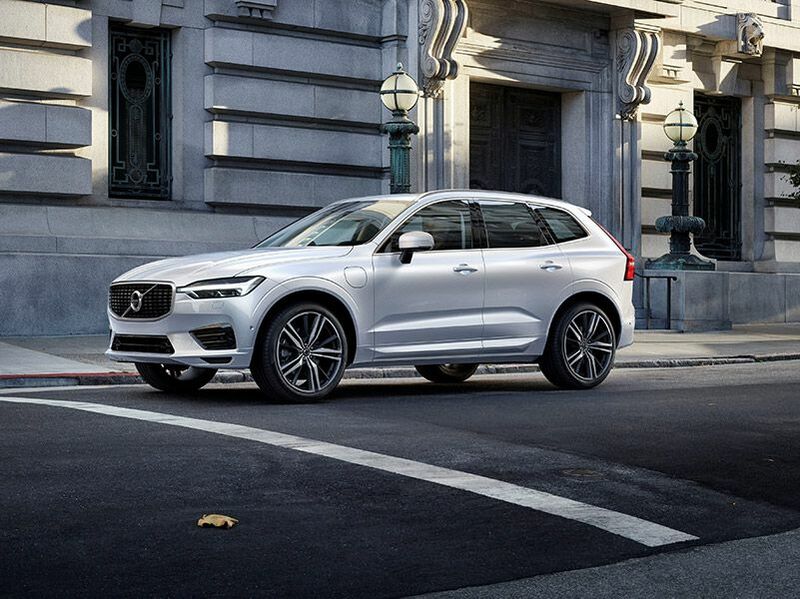 A revitalized Volvo continues to launch exciting new products in the United States, and one of the latest is the redesigned 2019 XC60. This compact entry offers many of the same luxury advantages as the larger XC90, including a solid crystal gear-shift lever, massage-function front seats, driftwood inlays, and a plug-in hybrid powertrain with an engine that’s both turbocharged and supercharged. The setup can unleash 400 hp and 472 lb-ft of torque, allowing the XC60 to dash from 0 to 60 in fewer than 5 seconds. With a lighter foot you also can drive the vehicle for some 17 miles using electricity alone. The gas engine kicks in after that for 483 miles of driving range at 26 mpg combined.